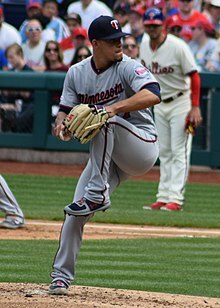 José Orlando Berríos (born May 27, 1994) is a Puerto Rican professional baseball pitcher for the Minnesota Twins of Major League Baseball (MLB). He was drafted by the Twins in the first round of the 2012 Major League Baseball draft. The Minnesota Twins selected Berríos in the first round of the 2012 Major League Baseball draft with the 32nd pick. He made his professional debut that season for the Gulf Coast Twins of the Rookie-level Gulf Coast League and was promoted to the Elizabethton Twins of the Rookie-level Appalachian League in August. In 30.2 innings pitched between both teams, he was 3-0 with a 1.17 ERA, striking out 49. During the 2013 season, Berríos played for the Cedar Rapids Kernels of the Class A Midwest League where he was 7-7 with a 3.99 ERA in 19 starts. Berríos started 2014 with the Fort Myers Miracle of the Class A-Advanced Florida State League. He was selected to play in the All-Star Futures Game in July. After going 9-3 with a 1.96 ERA in 16 starts, he was promoted to the New Britain Rock Cats of the Class AA Eastern League on July 7. In eight starts for New Britain, he pitched to a 3-4 record and 3.54 ERA. He also played in one game for the Rochester Red Wings of the Class AAA International League at the end of the season. Berríos began the 2015 season with the Chattanooga Lookouts of the Class AA Southern League, and received another midseason promotion to Rochester. In 27 combined starts between the two clubs, he posted a 14-5 record and 2.87 ERA. He started the 2016 season with Rochester. The Twins promoted Berríos to make his major league debut on April 27, 2016. In 18 innings pitched for Rochester prior to his promotion, he was 2-0 with a 1.06 ERA and 20 strikeouts. He was recalled and optioned multiple times during the season. In 14 starts for Minnesota, he was 3-7 with an 8.02 ERA, and in 17 starts for Rochester, he was 10-5 with a 2.51 ERA. Berríos began 2017 with Rochester. After going 3-0 with a 1.13 ERA in six starts there, he was promoted to the Twins on May 13, where he spent the remainder of the season. In 26 games (25 starts) with Minnesota, he was 14-8 with a 3.89 ERA. Berríos began 2018 in Minnesota's starting rotation and made his first start of the 2018 season on April 1, 2018. He pitched a complete game three-hit shutout (the first of his career) against the Baltimore Orioles, with 6 strikeouts, leading the Twins to a 7-0 win. Berrios tied his career high 11 strikeouts on April 12, 2018 in a 4-0 win over the Chicago White Sox. On April 18, 2018 Berríos finished with five strikeouts and no walks in seven scoreless innings for Minnesota in a game played in his native Puerto Rico before a sold out crowd at the Hiram Bithorn Stadium. Berrios became only the second Puerto Rican pitcher to start a regular-season MLB game at Hiram Bithorn; the first being Javier Vazquez, who made four starts there in 2003 with the Montreal Expos. His second career complete game came on June 7th against the Chicago White Sox, he became the 9th Twins pitcher to pitch a complete game and strikeout at least 10 batters without allowing a walk. Owning an 8-7 record with a 3.54 ERA over 18 starts, Berríos was named to the 2018 MLB All-Star Game. He was the only Twin selected to participate in the all-star game. In the All-Star Game, Berríos pitched one scoreless 5th inning, earning a hold in the game. Berríos finished the season with 12-11 record with a 3.84 ERA and 202 strikeouts over 32 starts, leading the league in complete games and complete game shutouts. On March 5, 2019, it was reported that Berrios would start opening day against the Cleveland Indians. He went 7.2 innings and had 10 strikeouts while not allowing a run. he received the win and the Minnesota Twins won 2-0. Berríos has played for the Puerto Rican national team twice, in the 2013 World Baseball Classic and in the 2017 World Baseball Classic, winning in both tournaments the silver medal. Berríos is married to Jannieliz Márquez. They have three children: Valentina, Sebastián, and Diego. Berríos' wife Jannieliz is the sister of Irmarie Márquez, who is married to Javier Báez, an infielder for the Chicago Cubs. During the offseason, Berríos went to his hometown of Bayamón and delivered water, food, and other supplies to people in need as a consequence of Hurricane Maria which caused massive damage to Puerto Rico in September 2017. ^ "Twins land pitchers Jose Berrios and Luke Bard in Draft's compensation round". Minnesota Twins. Retrieved April 26, 2016. ^ "Tom Powers: Twins' special pitching prospect Berrios endures growing pains". Twin Cities. Retrieved April 26, 2016. ^ "Souhan: Berrios appears to be a keeper for Twins". Star Tribune. Retrieved April 26, 2016. ^ "Minnesota Twins prospcts Jose Berrios and Kennys Vargas were named to the Futures Game roster". Minnesota Twins. Retrieved April 26, 2016. ^ "Meyer to replace injured May at Futures Game". Minnesota Twins. Retrieved April 26, 2016. ^ "Jose Berrios Begins His Quest". Puckett's Pond. Retrieved April 26, 2016. ^ a b "Top prospect Jose Berrios called up, will start Wednesday for Twins - StarTribune.com". Star Tribune. Retrieved April 26, 2016. ^ "Jose Berrios Stats, Highlights, Bio - MiLB.com Stats - The Official Site of Minor League Baseball". MiLB.com. Retrieved June 1, 2018. ^ Phil Miller (April 2, 2018). "Jose Berrios, Twins shut out Orioles". Star Tribune. ^ "June 7th 2018 Game Summary". Baseball-Reference.com. Retrieved January 14, 2019. ^ "StaTuesday: Berrios' latest gem a rare feat for Twins pitchers". Fox Sports North. Retrieved January 14, 2019. ^ "Twins pitcher Jose Berrios is headed to his first All-Star Game". Pioneer Press. Retrieved March 29, 2019. ^ Phil Miller (July 14, 2018). "Twins players perform so-so in All-Star Game appearances". Star Tribune. Retrieved March 12, 2019. ^ "2018 All-Star Game Boxscore". ^ "2018 American League Pitching Leaders". Baseball-Reference.com. Retrieved January 14, 2019. ^ "Twins tap All-Star Berrios to start Opening Day". Retrieved March 28, 2019. ^ "3/28/2019 Indians Twins Box Score". Baseball-Reference. Retrieved March 29, 2019. ^ Tawny Jarvi. "Twins 2, Cleveland 0: Jose Berrios and the Twins MarWIN". Retrieved March 29, 2019. ^ "World Baseball Classic puts top MLB prospects on global stage". Major League Baseball. Retrieved April 26, 2016. ^ "José Berríos sorprende con hermosa foto familiar". Primera Hora (in Spanish). July 7, 2018. Retrieved July 7, 2018. ^ Hayes, Patrick Mooney and Dan. "Javy Báez and José Berríos: Brothers-in-law forging their..." The Athletic. Retrieved March 29, 2019. ^ "Berríos ayuda a Puerto Rico". MLB.com. January 23, 2018. Retrieved July 8, 2018.